B. Don PARKER Leads the Mars Observation Race this Apparition! 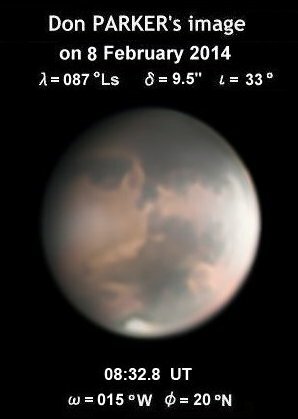 Don PARKER (DPk) produced an excellent image set of Mars on 8 February 2014 (λ=087°Ls) at 08:33 GMT when the surface showed the central longitude-latitude angles of (ω=015°W, φ=20°N) despite the fact that the angular diameter was still under 10". The subtle canal Brangaena is clearly revealed following the two nails of Sinus Meridiani, and a misty-dusty disturbance of the north polar cap (npc) could be well shown. Mare Acidalium is largely and finely depicted with details near the centre. Don obtained this superb description of Mars when he was 75 years old plus eleven days.